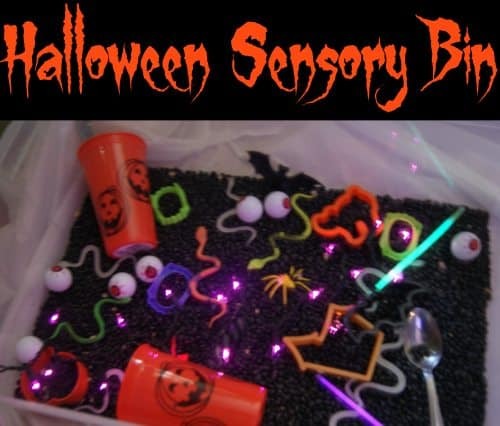 Spooky and oh so fun- the Halloween Sensory Bin Idea was a big hit with my kids. All items inside were either found at the Dollar Tree, in our supply closet, or with our Halloween decorations, making this a fun & thrifty activity. We are constantly coming up with new sensory bin ideas to keep the boys to keep the boys interested in playing with them. Sensory bins are a great way to keep kids entertained and can be themed to match what they are learning in school. Dried blacks beans are a great base. These black beans provide a nighttime feel & look great with the small string of lights & glow sticks. I picked up a couple packs of creepy crawlies at Dollar Tree, including glow in the dark snakes, brightly colored spiders, and bats. Vampire teeth, creepy eyeballs, and Halloween shaped cookie cutters were also fun additions to our bin. I added a couple Halloween plastic cups for scooping, filling, pouring, and dumping. Don’t forget something under the bin to make clean up easier. When we do sensory bins, I set everything up at the dining room table and put a play-time tablecloth on first so cleaning up any spills is quick and easy. With four boys, someone is bound to knock stuff out of their bin! What is your favorite sensory bin idea? Leave a comment below letting us know! Nice. Can’t wait to try this tomorrow. Great idea! My kids will love this! Thanks so much for sharing. Coming to you from the Mommy Monday Blog Hop.